As I am sure everyone knows, there is a movement in the United States known as “Black Lives Matter”. This movement came to life after the death of Travon Martin, who was a 17-year-old African-American who was fatally shot by George Zimmerman, a neighborhood watch volunteer. Zimmerman was lawfully acquitted in court by a jury of his peers, but some people were not satisfied with this lawful verdict. The movement gained momentum as it protested the 2014 deaths of two African-Americans, Michael Brown in Ferguson, Missouri and Eric Garner in New York City; in both cases the grand jury did not indict the officers and no charges were brought. Several other African-Americans who died at the hands of law enforcement have had their deaths protested by the movement, including Tamir Rice, Eric Harris, Walter Scott, and Freddie Gray. Apparently the Black Lives Matter hate group is very selective in determining which black lives actually matter. For example, they are nowhere to be found at the funerals of blacks who are murdered by other blacks. That number, by the way, is higher than the number of blacks killed at the hands of white police officers. The is another group of individuals that the Black Lives Matters terrorist group seems to have overlooked. Specifically, Craig Chandler, Rodney Condall, Terence Avery Green, Robert Wilson, III, Darryl Wallace, Juandre Gilliam, Liquori Tate, Sonny Smith, Daryle Holloway, Vernell Brown, Jr., Tronoski Jones, and Henry Nelson. This group of men are all African-American men, they are all members of Law Enforcement, and they all gave their lives in the line of duty this year. Don’t their black lives matter? Why is it that the Black Lives Matter terrorists are not protesting their deaths. Why is it that it seems these lives are not as important, do not deserve national attentions and are not being memorialized with hateful rhetoric by the Black Lives Matters hate group? Black lives matter, police lives matter, all lives matter. As one police chief put it, it is best if we dropped the qualifiers and simply state “Lives Matter”. I cannot argue with that. The qualifier are divisive and not helpful. But, I think that some lives matter more. If an individual loses their life at the hands of a police officer who is justified in his or her action, that life matters less than the life of a police officer killed in the line of duty protecting society from the criminals and thugs who prey upon you and I. The taking of any life is serious, and the taking of life has consequences. A police officer is left with the remorse he or she will naturally feel after taking a human life, the criminal psychopath, not so much. The killing of a police officer is heinous and it tears at the fabric, which is a very thin fabric, of our society. The national concern should go off the charts when a police officer is killed, but it does not. Even the president is more concerned over the justifiable killing of a criminal than by the murder of a police officer. One can only wonder. The protesting of taking the lives of criminals, as if it was a high crime of some sort, needs to stop. It would be wonderful if none of it ever happened again and we could all just live our lives on the Big Rock Candy Mountain. But that just is not going to happen. So instead of marching and protesting and calling for the murder of police officers, let us start marching, and protesting, and calling for better laws that makes the killing of a police officer a capitol crime with the death penalty attached . Because, as I said, all lives matter, but some matter more. My thoughts are people are going to kill each other, its human nature. But people who we expect to protect us shouldn’t be killing us. How would you feel if society has told you that you are less than human and proven it time and time again by murdering your friends and family with no consequences? The point to Black Lives Matter is because so many act as if they don’t. It is no different than any other movement that is directed toward a specific goal. It is not meant to negate other lives or other purposes, but to bring some attention to this one. It is the same reason there are gay pride parades. When We treat minorities with equality, we won’t need these movements just as we won’t need The American Cancer society if cancer is cured. If that were true then it would be different. Black Lives Matters misdirects and obfuscate the truth telling the message that white cops are purposely targeting and killing black men for no other reason then they are black men. This is not true. Black Lives Matter people have repeatedly called or the killing of Police Officers. Occasionally something terrible happens and a person is killed at the hands of the Police who should not have been. This is extremely rare. For the most part, the killings are justified and necessary. Black Lives Matter serves no valid purpose and should be ruled Domestic Terrorists. http://blacklivesmatter.com/11-major-misconceptions-about-the-black-lives-matter-movement/ Granted, this is on their website. But what sources do you have that they have been calling for the killing of police officers? 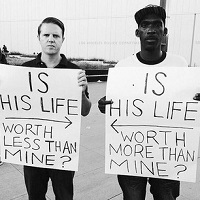 All lives do matter, of course. In this case, they are trying to raise and repair a specific issue. I am holding back my judgement on the two recent killings until more evidence comes forth but there is still inequality in this country. All ethnic groups are subject to being killed by the police. People are killed by the police when they resist arrest, fight beck, and put themselves in a position whereby the officer resorts to deadly force to save his life or the life of another. BLM tries to make people believe the blacks are unjustly targeted by police. This is untrue. More whites are killed by police than blacks. Many more blacks are killed by blacks committing criminal acts then are killed by police doing their duty. In other words, it is a non issue. People will die at the hands of police. That is a fact. Rarely do people die at the hands of police that it is not justified. The cops are the good guys and the criminals are the bad guys. Race really is not an issue. BLM wants to make race an issue, but it is not. Until someone can show that blacks are being targeted and murdered unjustly the BLM movement is pointless. There rhetoric is incendiary and they cause more harm then good.